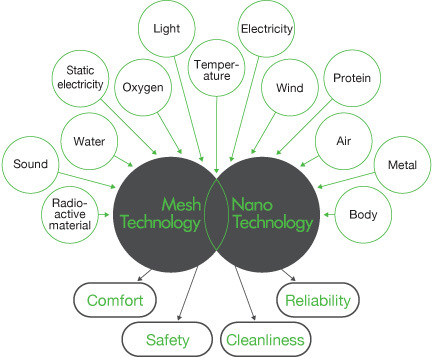 Although mesh is generally seen as a material for filtering or for improving air permeability, we at NBC Meshtec view it as a technology with the potential to change or even control other materials. By way of example, our meshes are used as screens in screen printing, and also play a variety of roles in the electronics industry to support the manufacture of world-leading Japanese electronic components. Our development team has also produced functional meshes by combining mesh materials with nanoparticles. This unique technology to enhance catalytic efficiency and uniformly arrange nanoparticles has enabled the addition of sterilization, deodorant, and superhydrophilic functions to meshes. We also continue to study associations with sound and vibration, as well as the other possibilities that mesh structures have to offer. In this way, new value can be given to various materials around the world through the use of meshes. We consider it our mission to contribute not only to the progress of industry but also to harmony with the environment and the maintenance of people's wellbeing. Bolters for flour milling ensure food safety, screen printing for everyday items helps to enhance living comfort, medical filters support people's wellbeing, and filters used for sewage disposal facilities ensure a clean environment. We strive to advance research and development for materials and processing technologies in order to enhance the value provided by meshes. Alternative fuels to be used in the future, for example, will require more durable meshes than those we currently supply to the automotive industry. To this end, we will spare no efforts in the pursuit of new materials and expertise in relation to metal mesh production. We will rise to the various challenges we face, such as an aging society, environmental issues and the advancement of medical technology, by taking advantage of all means available, including materials, processing techniques and weaving technologies. We plan to proceed with research into nano technology as one of our core applications. We are working on such research for Nafitec®, an NBC Meshtec proprietary technology that allows maximization of the surface area of nanoparticles, leveraging of particle functions and production of nanoscale meshes. Our development team is working toward a wide range of practical applications for nano technology without limiting its use to meshes, and is proceeding with development for commercialization in collaboration with various other research facilities. Nafitec® is an NBC proprietary nanoparticle immobilization technology that enables nanoparticles to be uniformly bound together without the need for covering with a binder. Using particles with properties such as deodorization, sterilization and catalytic action will allow the development of functional materials that make the most of their surface areas. Cufitec is a technology developed by combining Nafitec® with an original NBC antivirus material. It causes viruses to attach to a mesh and deactivates 99.9999% of them.